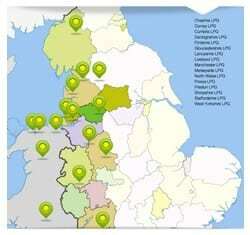 We are well established as a competitively priced LPG supplier to homes and businesses throughout the North West. Our goal is to provide LPG at the lowest prices without compromising the personable service that we pride ourselves on. Our business has gone from strength to strength in recent years on the back of these values and we are proud to be supplying LPG directly from Lancashire, Cheshire and Cumbria. It is a challenging and competitive industry but we are confident that we can beat your current LPG price – offering a cheaper fixed price LPG deal with a reliable and friendly service. Call 01772 707011, email lpg@premierlpg.co.uk or enquire online today to discuss your current price of LPG and find out what cheaper LPG deals we can offer you. Are you paying too much for your LPG? Contact our team of LPG experts to compare your current price with our fixed price LPG deals. With tankers supplying LPG from 3 locations in the heart of Cheshire, Cumbria and Lancashire we firmly believe we are best placed to build on our reputation as the leading LPG supplier to the North West of England. New rules mean you can change LPG supplier every two years free of charge and seek out the cheapest LPG price. Contact us on 01772 707011 as we are confident that we can help you save on your lpg costs. Whether you uses LPG for heating, cooking, FLTs or other industrial and agricultural processes we are confident we can provide the most competitive LPG price structure to suit your needs and consumption.